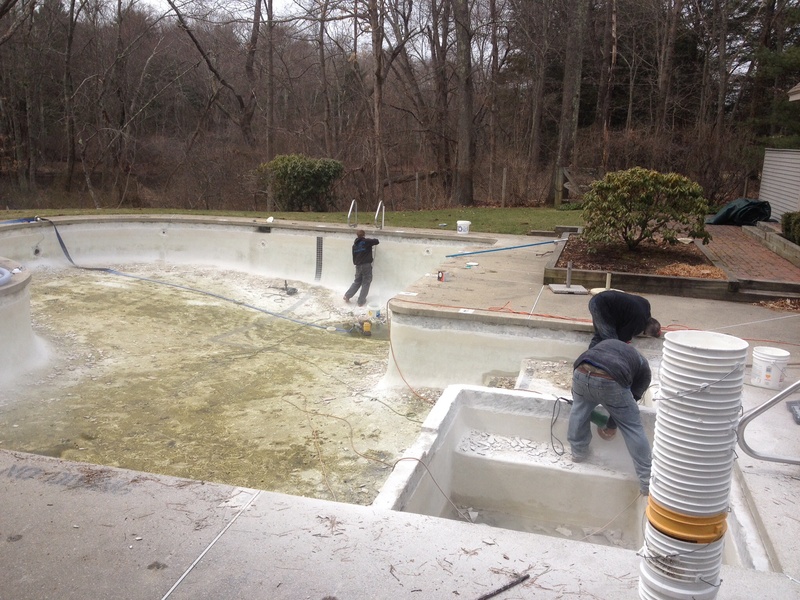 Affordable Pools is renovating the swimming pool for Phillips pond condominiums in Natick Massachusetts. The pool is 3 to 6 feet deep 168 perimeter feet with an attached spa hot tub. Affordable Pools removed all the tile and prepped the existing pool plaster. We will then apply new frostproof Pool Tile with the fortified swimming pool mortar and tile mixture. Once the pool tile has been installed and grouted, the pool and be finally prepped for the new SGM Diamond Brite pool plaster installation. Phillips pond of Natick MA decided to go with the cool blue Diamond Brite pool plaster which will looks really sharp with the cobalt blue Pool Tile. In a time when few people want to change locations for home or businesses, there is still a need to for a few alterations. Everyone requires a few new features in their lives. Pool remodeling can be a good way to change the look and feel of a hotel’s luxury feature, or to make a difference in the backyard of a home. The first step is to find someone who can help with pool remodeling. Chatham MA has many companies capable of renovations, but not all are specialists in pool remodeling. Chatham MA and surrounding areas can provide the experts needed to help. Pools can be more than simply a place to enjoy a cool dip on a hot summer day. Under the right conditions, a pool can bring a sense of glamour to a home the whole year round. Much of the change that a pool can see comes from finding the right people to complete the pool’s look. Before sitting down at the computer and running a search for “Pool remodeling NEWTON MA“, it can benefit a pool’s owner to know what they are really looking for in someone to do the work. In that search for Pool remodeling NEWTON MA, a homeowner should also have a list of questions ready to ask. For a home or business owner it can be discouraging to pull back the pool cover and find a problem. In the late spring and early summer, the only thought is having the refreshing, cool swim that owning a pool offers. No one wants to face a disappointed family or friends, and for a business not having a pool available can have a much higher cost. The second a problem is spotted it’s time to call for pool repair. Bedford MA is a wonderful place to spend a summer poolside, or take a dip on a warm day, so finding the people who can best take of that pool is important. The key is to find the best crew possible who put things right and perform a pool repair. Bedford MA gives plenty of opportunities for those looking for someone dependable to fix problems, but there are ways to spot the right company. Most people, particularly in the northern hemisphere, don’t think about their in-ground swimming pools when it is the middle of winter, and the pool is covered with a tarp and a foot of snow. When the weather starts to warm up in late spring, they start to consider opening the pool and preparing it for use during the summer months; they maintain it well during the summer because it is in regular use, and at the beginning of fall, they close it up, cover it, and don’t think about it for the next eight months. However, in-ground swimming pools require year-round attention to stay in good condition, and to avoid unexpected problems when opening the pool in spring, it’s best to have them maintained regularly. It is important to find a reliable and affordable pool repair company to not only perform regular maintenance on a swimming pool, but also to repair it whenever problems occur. It can be a lot of fun to own an in-ground swimming pool. During the summer months, when the sun is hot and the air is humid, a dip in the pool can be a refreshing and fun way to pass the time. Most pool repair and maintenance is required during the months when the pool is open and in use, but it is important to keep up with any necessary repairs year-round to keep problems from getting worse. In some areas of the country (such as the area of Framingham, MA), the weather is only warm enough to use a pool for a few months each year, which means that it must be opened at the beginning of the season, maintained while it’s open, and closed at the end of the season. Summer is the time of year when many people think about their in-ground swimming pools; it’s the perfect time of year to go swimming and lounge around for a tan, and when the weather is freezing, most people aren’t thinking about taking a dip. However, in reality, it’s important to think about your pool all year long, because it may need to have certain parts repaired or replaced, and it needs to be cared for properly no matter what the season. Proper maintenance is essential to prolonging the life of a pool and its components; when something does break or wear out, it is often cheaper to have a part repaired than to have it replaced, which is why finding a reliable, affordable pool repair company is important. Few people realize how much work goes into owning and maintaining an in-ground swimming pool. In the northern hemisphere, in-ground pools (unless they are indoors and heated) are only usable for a few months per year, and during those months, the pool must be diligently maintained, and repaired when necessary, to ensure that it remains in good working order. For example, in the area of North Andover, MA, the weather is usually warm enough to use the pool between May and September, though it varies a little depending on the year; these are the months when the pool requires the most diligent maintenance. When a pool has seen better times, or when there is clearly a need for a change this can be a chance to start a relationship with a good pool company. There are those businesses who only carter to a pool’s water treatment and cleaning, and then there are those who can perform several necessary jobs for homeowner that will be required for years to come. These are a few important points to consider when thinking about pool remodeling. Bedford MA is a good place to spend the summer by poolside, so it is important to see that remodeling is done correctly the first time. While considering pool remodeling, Bedford MA or anywhere, always be sure to look for the person who do the job right the first time.